We managed to make 15 miles today. As we left Sheep’s Creek we went straight into a class 4 rapid, the worst so far. 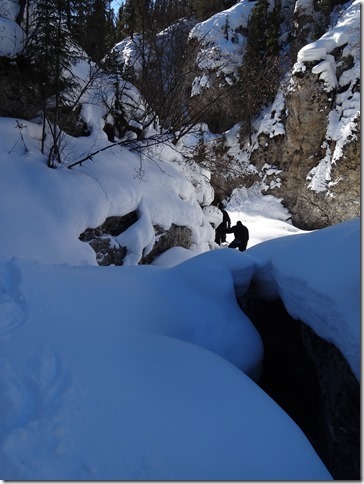 A lot of broken and collapsed ice, my sledge and I fell partly into a sink hole with the rapids running underneath me. It took 3 people to move each sledge with ropes and pulleys almost vertically up the collapsed ice slopes of the rapids. We are exhausted, it took us 2 hours to get through. The dogs are very tired and hate the overflow, so if you sledge too near the edge, they try to climb out of the wet onto the bank. We left the river twice to avoid a lot of bad overflow which held us back all day. We made very slow progress till about 3.30pm, then we made the rest of the miles to Joe Creek, which is a beautiful place. We had a very cold night. It takes about 3 ½ hours from waking to get going, feeding the dogs and ourselves, breaking camp etc. Hitting ice off the sledges takes about ¾ hour, and it takes at least 10 mins to get each boot on because they are frozen solid, and have to be defrosted over the Primus stove. Finally we set off and straight away we got into heavy overflow; this continued all day except for when we left the river, but then we were into deep snow so that made very slow progress as well. We are now out of the canyon so no more collapsed ice and no more tricky elevation changes. The countryside is getting wider with the mountains set further back. We made slow progress all day, only making 14 miles. At last we had a really good run, making the 22 miles to the border. We crossed an ice field, which is a massive lake all frozen solid. Lots of cracking and groaning in the ice under us as we sledged along, which is always worrying as you don’t want to go through and get wet! On the border we ran into a lot of willow trees and deep snow. It took 2 ½ hours to make the last 2 miles but we finally made the border. We met up with Earl Rolf who had come up from the south and spent the day re-supplying from the air drop, fixing stuff and checking over the dogs. Today we are going up into the mountains, 26 miles straight uphill, and we will camp on the top. Now that we are more southerly trees are beginning to grow and we can use firewood, but as we get into higher elevations the trees stop growing. It will be a two day run up the mountain till we can get more firewood, so we are taking a bit with us. It is 52 miles to the top of Lewis Creek. It has clouded over with a bit of snow now. We want to push on as hard as we can as I am worried about the condition of the Yukon River when we get to it. Sounds like VERY hard work with VERY cold feet. Hope you have a better run now. Thank you for putting up the stunning photos. 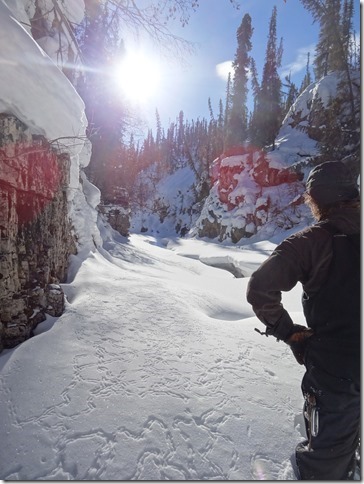 Thanks for the update and the great photos showing the type of difficult terrain you are navigating. DeLorme waypoints show us that you are now making decent progress on the current leg. I can't believe that Amundsen just turned around and did the journey in reverse after sending his telegraph messages. Whilst you are sleeping, our pupils are doing in-class presentations on various aspects of your expedition and climate change in the Arctic. Wishing you warm, dry boots! Keep going! Dear Mr Oakley, I hope your trip is going well. What are foods are you eating and how do you get it. The team has a supply of dehydrated meals that they carry and the dogs have a good grade of dog food. Hi I'm Hector. Do you hunt seals? Hi Hector, The team has moved inland and are away from any water ways that would have seals. Because of the time constraints on this expedition the team is not able to do any hunting. They have to carry all their food and the food for the dogs. Now that they have reached the United States there are caches of supplies for them that were placed by an air drop (plane) and snowmachine support crew. When they left Herschel Island their sled weight was up to 300 pounds, each sled, because of the supplies and equipment they had to carry. Now that amount is a lot less but still a large amount of weight to move along each day. During the time that Amundsen did his trip they did hunt and were also able to barter food and supplies from the many people...whalers, trappers, miners and local native tribes...that they passed along the way. This expedition is awesome and it is great that we have people like you on this planet. I think that even though you are on this planet you have the ability to discover a new planet. You are my idol!!!!! The team and dogs have been very lucky. None of the dogs have gotten injuries and 1 team member froze part of his foot but is able to continue. He is in contact with a doctor and is taking pain meds and antibiotics. Dear mr Oakley I hope your expedition is going well. How are the dogs, if they have pups what do you do? How do you deal with injuries? Good luck. Hi Finley, The dogs are not pups. On this expedition the team needed seasoned veterans to pull their sleds. They will deal with injuries as they happen. So far none of the dogs have received any injuries. The dogs are good and there are no pups Mr.Finley Alederton. None of the females were pregnant when the team left. Thankfully that will not be an issue on this expedition. But, if it were to happen...the team would attempt to get the female moved out and back to our kennel. Once long ago on another expedition this did happen and the mother had her pups and then a local pilot flew in and carried her and her pups out and back to our home. It is hard for me to say exactly how deep the snow is as I am looking at the pictures and it appears to be several feet deep. Dear Mr Oakley, what evidence of climate change have you seen? Good luck with the rest of your trip! Mr Oakley will not be able to look at these questions until after the expedition at which time he will do a detailed accounting of the changes between this expedition and the one in 1905. Dear Mr Oakely, Do you find it hard to motivate yourself, when even the dogs are struggling? Good luck in the rest of your journey! Well done on making around 51 miles in the past 4 days. Also well done on making it through a class 4 rapid, very impressive. Good luck when going up into the mountains, 26 miles straight uphill will be a good mental and physical test. Good Day Claudie and Bella, Mr Oakley will not see these questions until after the trip but I can tell you that for Wayne Hall the challenge is what keeps him going. He has dreamed of this trip for a long time, as has Mr Oakley, the desire to complete that dream pushes him along. Good luck on your expedition! 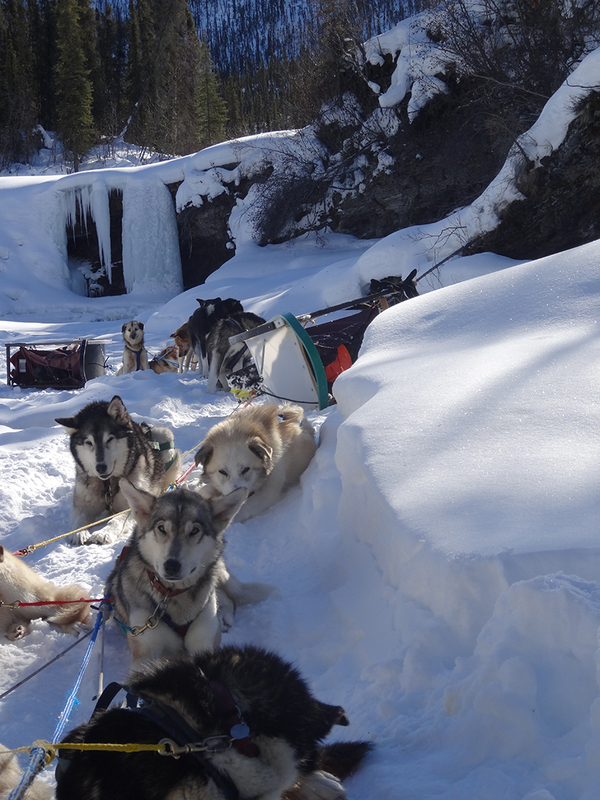 We were wondering what would happen to your dog team, at the end of the expedition and where did you get them, from? The dogs are from the kennel of Bush Alaska Expeditions and when they get home they will have a dog house filled with lots of fresh straw to curl up in and relax. Mr. Oakley, What will happen to the 22 dogs after the expedition is finished? They will return home to their kennel and curl up in their dog houses with lots of fresh straw. 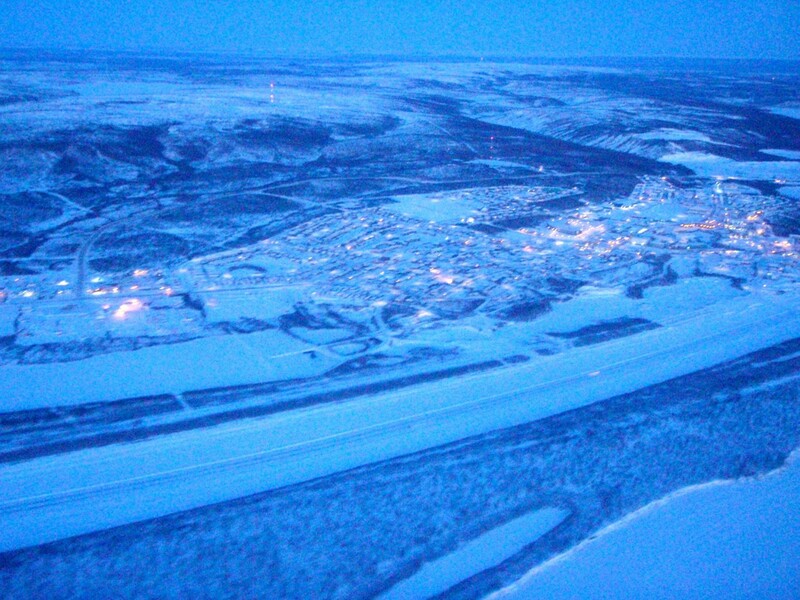 Much warmer here in Whitehorse! And yes, the mouth of Joe Creek is a wonderful location. Have only seen it in summer though. Safe journeys; onto the Porcupine River soon. No swimming, hopefully. Good Day Mimi, Luckily the team did not see any polar bears. They were further out on the sea ice this time of year. In Canada the team was not allowed to have guns but they were prepared with noise makers and other items that would have hopefully frightened the bears away. Hi Beano, Our dogs are very much a part of the family. If a dog's injury were bad enough to where it needed attention from a vet the team would plan to call in a local plane to move the dog to a place where it could receive help. This happened on a different expedition that Tim and Wayne were on a few years ago. It was not a team dog but they came across a musher that had a dog that was very sick. They had a local pilot come in and pick up the dog. Good Morning, my name is Hector Perry, son of Clair Perry. I was wondering have you seen any penguins yet on your travels? The very best of luck in your exhibition. Hi Hector, The team is further inland now and away from any waterways where they would see penguins. It was probably a good thing that they did not see any. I can just imagine our 22 dogs on a penguin chase. These dogs have a very big chase instinct. Dear Mr Oakley, Well done on your expedition so far, and well done on going through a class 4 rapid. My question is how much of the expedition will be going uphill or through deep snow? Best luck with the rest of the expedition. Hi Bob, The teams reached the highest point a few days after crossing the border. They are now on a slight downhill run as they traveled down the Coleen River and now the Porcupine River. 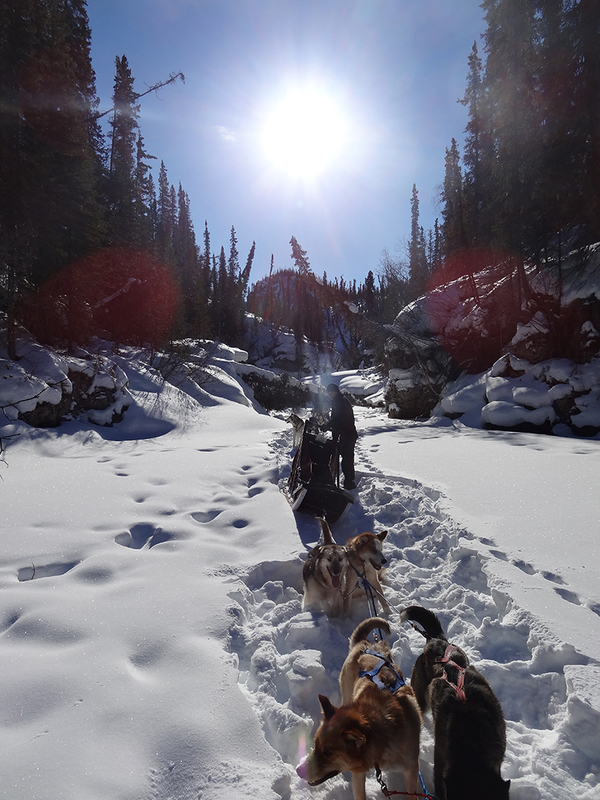 Once on the Yukon they are on basically flat trail that winds through jumble ice and through some land passages but no more major hill climbs. With luck they will now be on trails that only have a few inches of fresh snow on them. While on the Firth when they were not battling bad overflow they were having to bust through several feet of heavy snow pack. Hello Mr.Oakley We really like your expedition and we are both interested in it. Hi I'm Marcus, I was just wondering how your trip is going? Dear Mr Oakley and Team, Firstly, thank you so much fpr being an inspiration to us all. I was wondering approximately how long will it take approximately to reach the end of your journey since you are now almost on your final stretch. Hi Lena, The teams plan on covering about 30 to 40 miles a day with a day off now and then. Their completion date will be near the end of the month. There are a lot of miles yet to travel. They are still some 300 miles from Eagle. Stunning scenery Tim - thanks for the great pictures! Sounds like you've been having quite a gruelling time of it on the last leg. Hope the next leg goes more smoothly and you can at least stay dry - if not warm! Best of luck.